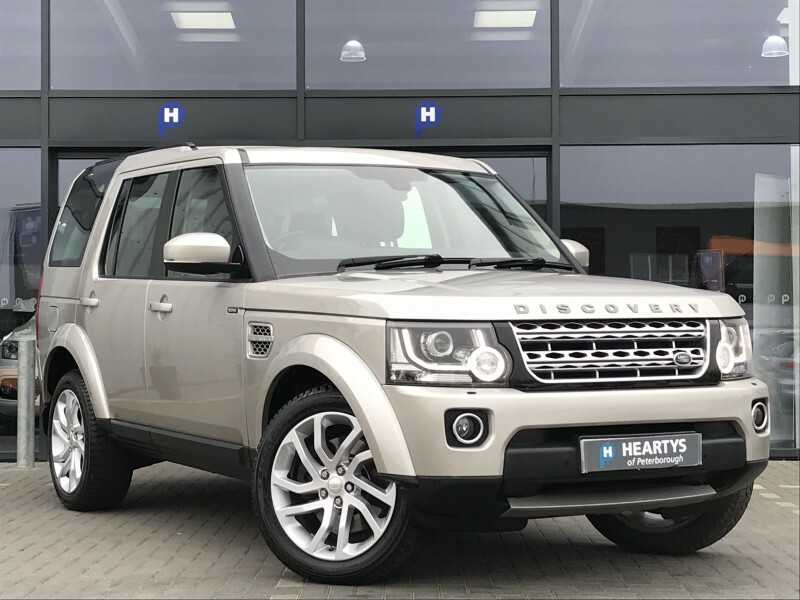 BUY THIS FANTASTIC SPECIFICATION 2014-64 LAND ROVER DISCOVERY 4 3.0 SDV6 HSE AUTOMATIC 7 SEATER 5 DOOR FINISHED IN THE PREMIUM METALLIC PAINT UPGRADE ARUBA GOLD WITH FULL HEATED ELECTRIC MEMORY EBONY LEATHER SEATING. GRAND BLACK LACQUER WOOD TRIM FINISH. 1 KEEPER FROM NEW WITH A FULL LAND ROVER MAIN DEALER SERVICE HISTORY, 3 X SERVICES. GREAT SPEC INC 20" ALLOY WHEELS, SAT-NAV, REVERSING CAMERA,XENON HEAD LIGHTS,,TOW PACK. MERIDIAN SOUND UPGRADE, FULL SIZE ALLY SPARE WHEEL. READY TO DRIVE HOME TODAY. HEARTYS OF PETERBOROUGH, A FAMILY RUN BUSINESS BASED IN PETERBOROUGH ESTABLISHED IN 1968, WITH ALL OF OUR CARS HPI CLEAR, AND INDIVIDUALLY SOURCED, WITH SERVICE HISTORY, AND FANTASTIC FEATURES SUCH AS... (FULL LAND ROVER SERVICE HISTORY WITH 3 X STAMPS IN THE BOOK, LAST SERVICED ON THE 21/8/18 @ 84,723 MILES) FLEXIBLE FINANCE DEALS AVAILABLE - ....GREAT PART EXCHANGE DEALS AVAILABLE.....CALL NOW FOR DETAILS... ALL CARS COME WITH A COMPREHENSIVE 3 MONTH WARRANTY - VISIT OUR WEBSITE FOR OVER 250 VEHICLES IN STOCK - www.heartysofpeterborough.co.uk NO ADMIN FEES!! Land Rover Discovery SDV6 Hse 3L 5dr.